Mr. Hyatt sent Mrs. Berry another check towards her good work and says how he is sorry that he and his wife missed her due to an accident with his finger and a subsequent infection. He continues on by hoping he will see her in good health when they travel to New York in a year. At the end of the letter, he informs Miss Berry that they had met Charles Lindbergh and seen his famous plane. 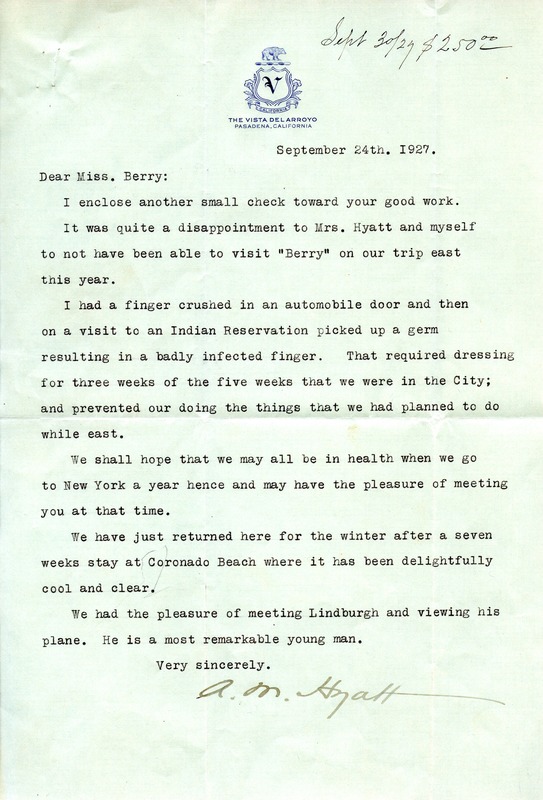 Mr. A. M. Hyatt, “Letter to Miss Berry from A. M. Hyatt.” Martha Berry Digital Archive. Eds. Schlitz, Stephanie A., Garrick Bodine, Sheila Lutz, et al. Mount Berry: Berry College, 2012. accessed April 19, 2019, https://mbda.berry.edu/items/show/4582.